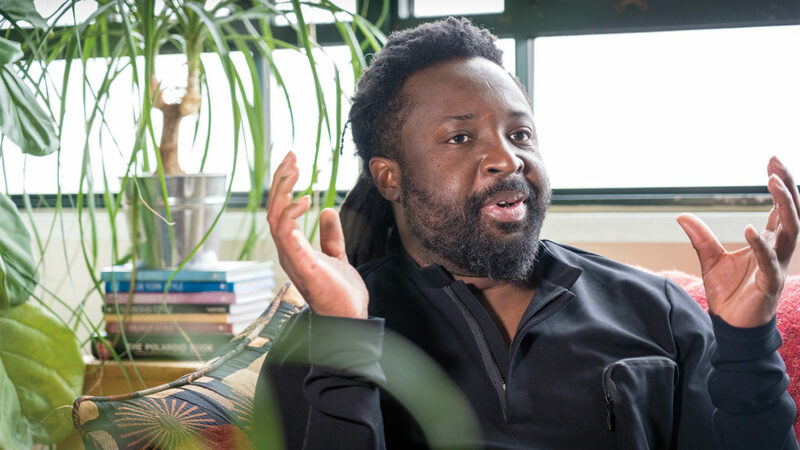 Despite the eclectic paintings on the walls and the giant windows overlooking South Minneapolis and the Mississippi River beyond, Marlon James insists there’s nothing particularly inspiring about the place he calls home, even though it may seem like an artistic oasis from the outsider’s perspective. For one thing, he says, none of the creative magic happens here, anyway. For another, he’d probably object to applying the term “creative magic” to his work at all—having just published his fourth novel, he knows by now that good writing is the result of daily routine, not random acts of inspiration. A dozen years ago, the idea of a fourth novel might have seemed fanciful. Overcoming now-legendary difficulty (to the tune of 70+ manuscript rejections), James published a promising debut, and joined Macalester’s English department in 2007 as a visiting professor. 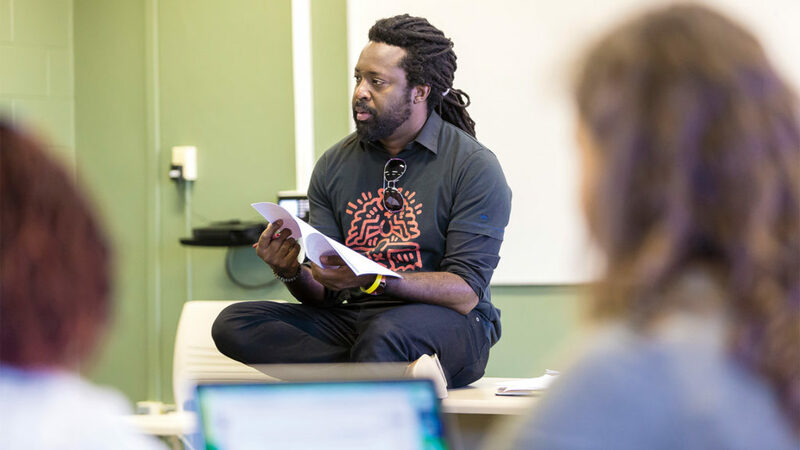 After that initial travail, his career trajectory has been nearly straight upward: he was promoted to a tenure-track professor before being named the college’s first writer in residence in 2016. He has taught and inspired hundreds of students through his courses, including Introduction to Creative Writing, American Literature, and advanced workshops that guide students through writing a novel in a semester. And, of course, he kept writing himself, publishing two more novels about his native Jamaica: The Book of Night Women, which won a Dayton Literary Peace Prize and a Minnesota Book Award, and A Brief History of Seven Killings, which won (among other things) the Man Booker Prize, perhaps the most prestigious award in all of English literature. His latest novel—Black Leopard, Red Wolf—was listed among the most anticipated works of 2019 in publications ranging from book blogs to the New York Times. We recently visited James at home to ask him about the book, his thoughts on writing and teaching, and why he still believes in fiction. Tell us about Black Leopard, Red Wolf. The book is the first part of a trilogy called Dark Star, the significance of which I’m going to reveal way in the future. It’s one story: a slave trader hires seven mercenaries to find his child and they completely botch it. The child is dead and there are only three witnesses, and each novel is a different witness telling the story. They’re telling versions of the same story that don’t add up at all. The trilogy plays a lot with African history and mythology. As much as I’m hugely inspired by European mythology and history, I really wanted to write something that has nothing to do with those traditions. One thing that’s different, for example, is what we associate with night: the witching hour, midnight, darkness is scary. These mythologies lead into troubling perceptions in the West that have spilled over into everything from race to how we look at evil. None of that exists in African mythology. In African mythology, it’s high noon that’s the scariest time of day. Vampires have no problem killing you in the daylight. It’s like a Western—it’s high noon that’s deserted, it’s high noon when people don’t go out. Midnight, on the contrary, is called the noon of the ancestors. It’s when your great-grandmother shows up, and who wouldn’t want the great-grandmother to show up? She’s way cooler than your mother. Why was telling three versions of the story important to you? The first thing I got rid of was the idea that there’s one version that’s authentic. In African storytelling, a lot of storytelling is done by the trickster. It’s a very European thing to think that because I’m telling you a story, the story is true. A lot of ancient storytelling didn’t look for truth in that way. Even when I was growing up, a lot of the stories my parents and grandparents told me every day were the same story—they just changed the ending. I don’t go back to ask, “Well, which one of these is true?” They’re all true and they’re all false. That’s a more realistic idea about storytelling. In this book, the reader is going to have to decide: who are you going to believe? What do you think is justice? I’m not going to decide for them. I’m just going to put out these three people who are telling the same story. Who do you trust? Is that what you set out to write, or did it change over time? None of my books end up the way I intended. The one thing that they all have in common is that I’ll have a pretty solid idea, and then a character shows up and completely wrecks it. In my second novel, there was this character who was supposed to be a cleaning woman in a bar. I wondered: “Well, what’s her story?” And that rabbit hole went on for 600 pages, and it became her novel. A Brief History of Seven Killings started as a crime novel set in New York and Chicago in 1985. The main character was a hit man who was born in Chicago who is probably the sloppiest hit man ever, and he’s having romance troubles. And somehow that novel became a story about the Bob Marley assassination, which begins in 1976.
so instead of starting in the throne room and ending up on the street, it started in the street and ended up in the throne room. And that worked. Carlos Fuentes says there is no greater tragedy than a book ending exactly the way you planned it. And I think if that happens, maybe the writer’s having too firm a grip on the story. You’ve called this book an “African Game of Thrones.” How did you make that jump fully into the fantasy world? In the realities I write about, the distinction between real and surreal isn’t there. Even my last novel is still anchored by a ghost who knows he’s dead. I guess people call it magical realism, but nobody who practiced magical realism called it that. Gabriel García Márquez wasn’t writing magical realism—he was writing reality. A world where there is real-life corruption and political intrigue, and a world where there are dragons and fairies, can be the same world without anything special about that. I grew up reading fantasy. I learned more from comics than I did from any literary novel. It wasn’t as dramatic a turn for me as it might seem. What was more dramatic for me was letting go of the very same kind of Eurocentric beliefs because that’s what I was raised on. One of the running gags in the new novel is this ridiculous idea of the magical child, the child who shall rise up to lead armies against the tyrant. In my book, people make fun of it. They say, “What sort of stupid magical child are you?” And the magical child in the novel ended up doing a lot of things that magical children aren’t supposed to do. How do you relate to your characters? You do develop a relationship with characters, particularly the villains. It’s pretty easy to fall for the heroes, but you have to love everybody when you’re writing a story. You have to love that villain into existence. When I’m done with a book, I do end up missing my characters quite a bit. I spend a lot of time with these people, and I get to know them in ways that nobody else knows. It’s not different from getting super-involved in a relationship that ends. A huge part of writing is knowing when to say goodbye to a character and to resist writing more than you should. It’s almost like knowing when to leave a party or when to leave somebody’s house. You can wear out your welcome with a novel. I like novels that leave me imagining what happened 10 days after the story ended. They continue another life in your head—or maybe your fanfiction account. I love the idea of fanfiction: people who have fallen for characters and don’t want to let them go. That’s when you know you’ve written a good character. Do you ever get stuck while writing—and if so, how do you get unstuck? All of my writer’s blocks happen before I start a book. Figuring out what story to tell: that’s its own crisis that can take me two years. Figuring out who’s going to tell it? That’s another year. I’ll do tons of trial and error to figure out just whose story it is. When I’m actually writing, then I write pretty fast. I wrote this novel in 16 months. I wrote my second novel in 18 months, but it took me two years to get there. It’s still a three-year process to write a book. People ask me about my process. My process is: having a really cool bunch of friends who will say random stuff, and somehow I end up with a novel. That’s why I don’t believe in the myth of the reclusive author. There’s no good reclusive author. You need people. Writing is a very solitary profession that can only happen in a community of people. What happens in two years of research? I tell my students you don’t create stories, you find them. I go through dozens if not hundreds of pages of fiction that won’t go anywhere because it’s me again trying to figure out what to write—and there’s no other way to figure out what to write other than to write. It’s trying on ideas for size and seeing if they work. When I sit down with my laptop, I go to work. To me, writing is work: that’s part of my process, that it’s a job. I’m a big believer in that if you establish a routine, the muses show up. I love when people say they write when they’re inspired. I’m like, “Oh my God, I haven’t been inspired to write since the Carter administration. How does that work?” I’ve got to pay bills. I can’t wait on inspiration to write a novel. I’d never write anything. It’s a vocation. It’s practice. Dancers, musicians, and actors know what I’m talking about—I don’t have to convince them. But writers will say things like, “I couldn’t write today because I didn’t feel inspired.” And I’m like, “That’s lovely.” It’s about doing the work—and knowing that inspiration or creativity will show up once they realize you’re serious. Writing is something I still approach with fear. I’m terrified when I start anything. I reach every blank page thinking this is the story where it will all crash and burn. There’s a difference between fear and being afraid. Fear is super useful. There’s a part of your brain that springs to action when the stakes are high. You have to write like this is going to be your last book, that they’re coming to take your pencils if you don’t write. Even if you have to invent stakes, you have to believe it matters. You’d better bring your best game. I approach reading two different ways. If I’m writing a book, I usually have a reading list, and that can be dozens of books: for style, for factual research, some I’m reading just because I want to be inspired or because they pave the way I want to go. If I’m writing, it’s very hard to read books for fun, so I have a huge stack now that I’m trying to get through before I start writing the next book. When I’m not writing, then I can go back to reading books—I don’t want to say for pleasure, because all reading is a pleasure for me. I read pretty much everything: tons of crime fiction, loads of sci fi, comics, literary fiction (but not as much as the other genres). I’m always on a mission to recapture the feeling of the first time a book blew my mind. As successful as you’ve been with writing lately, what keeps you teaching at Macalester? It’s fun to teach. It’s even fun to watch students challenge stuff I’ve taught them, because I say, “Bear in mind that everything I’m telling you is still one person’s opinion.” I learn a lot from these students. It’s certainly helped me to become a better writer. Outside of teaching, I’m surrounded by professional writers who already have a very narrow idea of what they’re here to do. At Macalester, I’m constantly surrounded by students who are still defining that, for whom the literary universe is wide open and almost every day is a day of discovering something. That’s really, really infectious. That’s really why I keep doing it. Seeing people unlock something that they probably never even knew they had, or seeing them become better writers in huge leaps is inspiring. I hope they realize they can write their way out of anything, that they can confront issues and problems through writing, examine the complicated nature of the world through it. Hopefully I’m not just equipping them with tools for writing but some kind of tools for living, too. We tell ourselves fantastical stories to process the world. It’s one of the things I think ancient and present-day African storytelling has known all along. That’s why we have dragons. That’s why we have monsters. Hell, that’s why we have Bigfoot. The myths are what tell us about ourselves. We always use these fantastical creatures and stories to talk about what’s right in front of us. Our minds want the leap, we want the fantasy. That brings us closer to reality than reality itself. That’s something that the ancient storytellers already knew, but we need reminding. Art is one way of seeing the world and dealing with the world—the only thing that can do both things at the same time. That’s why we need it. That’s why we need fiction. 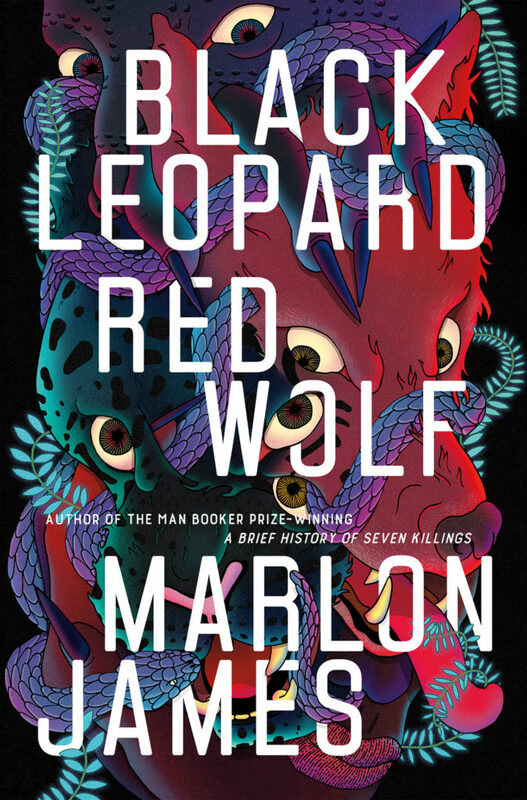 The following excerpt is from BLACK LEOPARD, RED WOLF by Marlon James. Published by arrangement with Riverhead Books, a member of Penguin Random House LLC. Copyright © 2019 by Marlon James. We took one bow, many arrows, two daggers, two hatchets, a gourd tied to my hip with a piece of the cloth inside, and set out before first light. “Are we finding the boy or killing him?” I said to the Leopard. “He’s seven days ahead. These are if someone finds him first,” he said behind me, trusting my nose, even though I did not. The boy’s smell was too strong in one spot, too weak in the other, even if his path was set right before me. Two nights later his trail was still ahead of us. “Why didn’t he go north, back to the village? Why go west?” I asked. I stopped and the Leopard walked past me, turned south, and stopped after ten paces. He stooped down to sniff the grass. “Who said he was from your village?” he asked. Before I said more, he was on all paws and gone into the thicket. This was a dry area, trees skinny as stalks, as if starving for rain. The ground red and tough with cracked mud. Most of the trees had no leaves, and branches sprouted branches that sprouted branches so thin I thought they were thorns. It looked like water had made an enemy of this place, but a water hole was giving off scent not far away. Near enough that I heard the splash, the snarl, and a hundred hooves stampeding away. Leopard got to me before I got to the river, still on four paws, a dead antelope in his mouth. That night he watched in disgust as I cooked my portion. He was back on two legs but eating the antelope leg raw, ripping away the skin with his teeth, sinking into the flesh and licking the blood off his lips. I wanted to enjoy flesh the way he enjoyed flesh. My burned and black leg disgusted me as well. He gave me a look that said he could never understand why any animal in these lands would eat prey by burning it first. He had no nose for spices and I had none to put on the meat. A part of the antelope was not cooked and I ate it, chewed it slow, wondering if this was what he ate when he ate flesh, warm and easy to pull apart, and if the feeling of iron spilled in your mouth was a good one. I would never like it. His face was lost in that leg. “The trees are different,” I said. He threw down the bone and looked at me. “What else did Asani tell you before he tried to drown you?” he said. “My family is there,” I said. He looked to the fire. His mouth goes sick from the sight of cooking, but he made the fire. From the gourd I pulled the piece of cloth carrying the boy’s scent. These were not trees he could sleep in, even if he preferred to sleep off the ground. “Come with me,” Leopard said. I knew he was looking at me. I was staring into the flames but could feel him turn his head. The night wind was sending a fragrance I did not know. Ripeness from fruit, maybe, but nothing was fruitful in this bush. This made me remember something. “What happened to them who were following us?” I asked. “No, those are always real,” he said with a wicked smile. He reached over and grabbed my shoulder.